HPM has been representing the world leaders in Swiss machine tools since our beginning in 2008. We have a wealth of knowledge of the Swiss Turn Industry, "Single and Multi Spindle systems. Flexibility and reliability are vital qualities in any CNC machine you invest in. Certainly options including a larger spindle, a large tool magazine, or even an auxiliary tool for complex parts can be desirable. But, for Swiss-style lathes, part tolerance and repeatability are paramount. When the job calls for a small, highly precise part, it’s the Nomura Swiss-style lathe that answers. Gosiger supports and provides Nomura Swiss-style lathes that are up to the challenge. As the exclusive North America distributor of the Nomura Swiss-style lathes, Gosiger not only provides training on how to use them, but can also help determine the right options and provide service for the life of the machine. Your CNC operators will be more efficient and pleased with the ease of operation. With five series to choose from you are sure to find the machine to turn out your small parts orders. SB6 Series – 4 types are available. Type I is ideal for turning operations, while Type III is for more sophisticated, high precision machining. Full C-axis with both spindles. 16mm bar capacity. U3 Series – Nine stationary tools and 4 live tools for improved performance. Standard 200mm bar length can be optionally increased to 500mm. UB8 Series – Rapid feed rate of 36m/min is standard with options like off-center drilling on the main spindle and independent X and Z axis motion available. J Series – Independent slides for both the main and back spindle, full C-axis functionality and customizable options allows this machine to perform machining typically found only with larger CNC machines. YB Series – The flagship of the Nomura line of Swiss-style lathes. 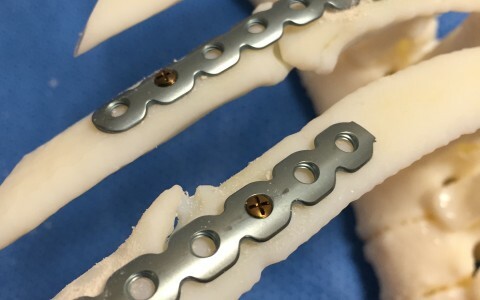 Ideally suited for highly complex parts with tight tolerances. The TNL20-9, which has nine linear axes, two turrets (each with 8 stations, max. 12,000 rpm, 2.0 kW), a back working attachment (4 stations), and an autonomous counter spindle. The TNL20-9 can deploy three tools simultaneously, resulting in increased productivity. The TNL20-11 is equipped with an additional front working attachment (6 stations, 3 of which are live, max. 12,500 rpm, 2.0 kW) on an autonomous X/Z slide. 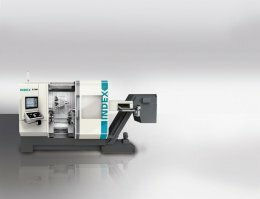 Through interpolation of the H indexing axis of the front working attachment with the X-axis of the autonomous compound slide, Y machining operations or tool offsets can also be easily performed with the front working attachment on the main spindle. 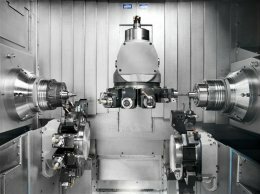 At this equipment level, it is also possible to produce with up to four tools simultaneously to reduce machining times. 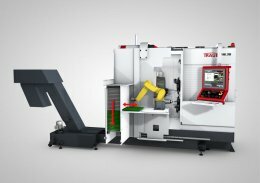 The G200 is geared to the needs of the market, offering flexibility and high-speed machining of both bar stock and chuck parts complete in one setup. The machine bed is arranged vertically, making the machine stand higher, but extending the work area, permitting a second lower tool carrier to increase the productivity of the machine. Reducing cycle times by 30% compared to the first G200 generation is well within the bounds of possibility with appropriate work-pieces. Fluid-cooled main and counter spindles are designed identically and feature a bar capacity of 65 mm (chuck diameter max. 165 mm ). Their motorized spindles allow productive turning machining with a power of 31.5/32 kW (100%/40% duty cycle), a torque of 125/170 Nm and a maximum speed of 6000 rpm. The G200 has three tool carriers so tools can be assigned to almost any machining type on the main and counter spindles independently. This means great flexibility for the programmer in organizing the machining steps. Due to the large work area, it is even possible to work with three turrets simultaneously on the main spindle or counter spindle, without them interfering with each other. One example: the lower right turret with an angular tool can machine the inside of a work-piece clamped in the main spindle, while the other lower turret and the upper tool carrier machine the outside. The same is also possible on the counter spindle. This increases the possibilities to use three cutting edges simultaneously, in some cases even 4 tools. Two 14-tool turrets are arranged in mirror image, each with an independent Y-axis (+/- 45 mm). All tool stations can be equipped with live tools. Tools with internal coolant supply (up to 80 bar) can be used as well. A special feature is the upper tool carrier, which has an additional Y-axis (+/- 65 mm) and a 360-degree swiveling B-axis. 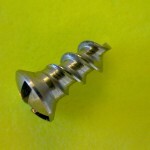 It is designed on one side to provide an added 14 tool positions and has a milling spindle on the rear. Its drive delivers speeds up to 7,200 rpm (power 22 kW, torque 52 Nm at 25% duty cycle). HPM represents NOMURA here in New England. They are Nicely Priced and they are Very Well built, Very Fast, easy to work on and offer many Key features such as Fully functional B axis for more heavy duty milling! 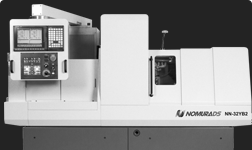 NOMURA YB2 series of machines offer a high degree of adaptability with independent slides for the main and back-spindles to increase productivity and the machining of highly complex parts. 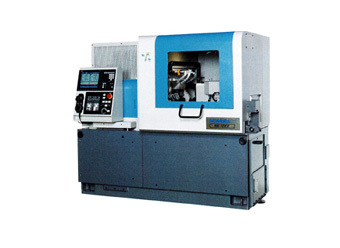 The machine configuration can easily be modified on site to accommodate production requirements. The main and sub-spindle have standard full C axis and are independently temperature controlled. A variety of options are available which include a front and back eccentric drill unit, and various combinations of turning and mill/drill units.